Yonkers, N.Y. – The hijab, burqa and other coverings are some of the most recognizable symbols of Islam, and are often depicted as forms of female oppression. Yusef Abdul Jaleel uses illustrations to combat negative stereotypes associated with Islamic clothing and modesty in his new show “Covered: Celebrating Muslim Women” opening June 7 at the Riverfront Art Gallery at the Yonkers Public Library. The exhibit runs from June 7-24, with an opening reception on June 7 at 5:30 p.m. that will feature discussions with the artist and refreshments. The reception is held in conjunction with the First Thursday Gallery Hop, which celebrates its one-year anniversary in June. “Covered: Celebrating Muslim Women” is a series of brightly colored graphic designs depicting various Muslim women around the world showing the variety and beauty of coverings. Using illustration, Jaleel explores Muslim women’s clothing and modesty as an extension of faith, a form of beauty and as a positive representation of Islam. These images create a more nuanced conversation around Muslim women that is often at odds with the media’s portrayal of the religion and its people. 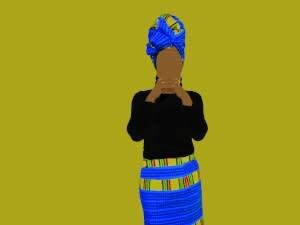 Yusef Abdul Jaleel (Jerrard Scott Joseph) is an African-American Digital Media Artist who specializes in vector-based illustration living in Yonkers, New York. With over 20 years of experience in digital print production, he has created media and clothing geared towards the Muslim experience in America. As a devout Muslim revert, Yusef attempts to convey art that is both permissible by many Muslims who shun the detailed facial imagery and non-Muslims alike. The opening reception is free and open to the public and is part of the monthly First Thursday Gallery Hop, which takes place on the first Thursday of each month, attracting hundreds of attendees to downtown Yonkers. It is produced by Haifa Bint-Kadi, the founder of the First Thursday Gallery Hop, and sponsored by the Yonkers Gallery Group, an alliance of galleries including Blue Door Art Center, Friends of Philipse Manor Hall, Urban Studio Unbound, and Yonkers Riverfront Library. If you would like more information, please contact Haifa Bint-Kadi at (914) 500-7103. The Riverfront Art Gallery is on the fourth floor of the Yonkers Riverfront Library, located at One Larkin Center, and is accessible to people with disabilities. Parking is available at sidewalk meters and for a fee in the nearby Buena Vista and Warburton Parking Garages.